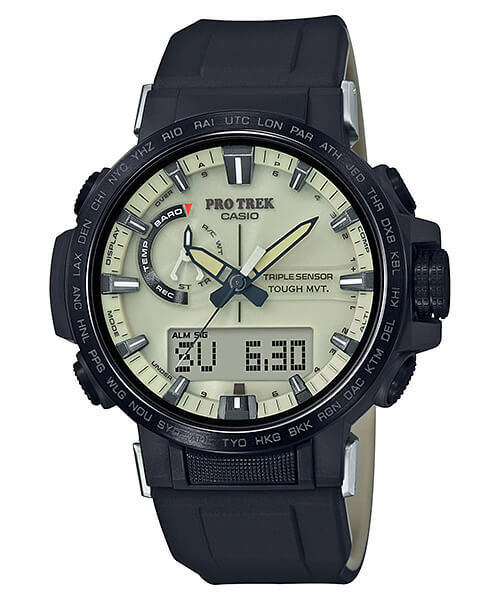 Casio is adding two new Pro Trek PRW-60 models in November 2018: the PRW-60FC-1AJF with a hard composite band and the PRW-60YGE-1AJR which includes both an elastic band and Dura-Soft silicone band. 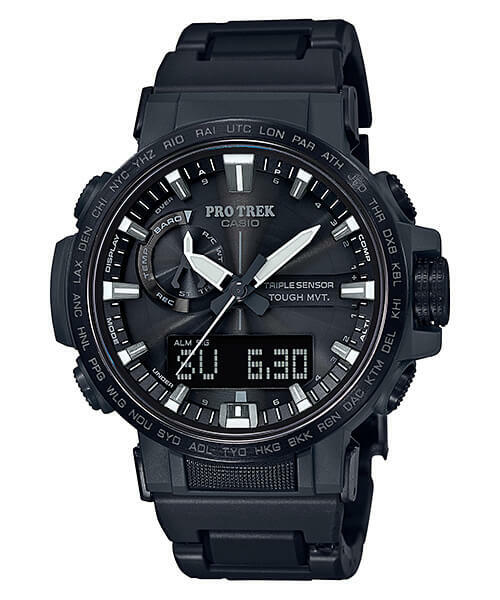 The PRW-60FC-1AJF is a basic black model with a reverse STN LCD display and a composite, double-lock clasp band. The band is made of urethane and fine resin along with inserted metal parts. The PRW-60FC-1AJF along with the PRW-60T-7A featuring a titanium band are currently the only PRW-60 models with a hard-link band. The PRW-60YGE-1AJR has a standard STN LCD display with a beige-colored face and the matching elastic band has a camo-like earth pattern designed for the outdoors. Judging by the model number, the PRW-60YGE-1AJR is a limited edition watch. As part of the PRW-60 series, the PRW-60FC-1AJF and PRW-60YGE-1AJR are smaller (50.5 x 47.2 x 13.3 mm) analog-digital watches suitable for men and women. 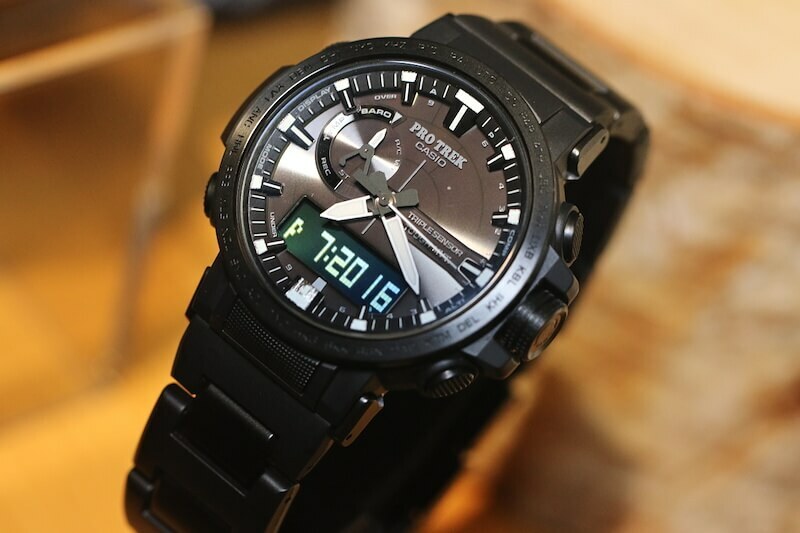 They are equipped with the Triple Sensor (altimeter-barometer, compass, thermometer), a high-end STN LCD display, and the Neon Illuminator blacklight LED. Other notable features include Tough Solar power, Multi-Band 6 radio wave time-syncing, and 100-meter water resistance. The PRW-60FC-1AJF and PRW-60YGE-1AJR have a list price of ¥74,000 JPY and ¥59,000 JPY, respectively. Not sure, though the PRW-60 series was announced at Baselworld 2018, it has only been released in Japan and China so far. 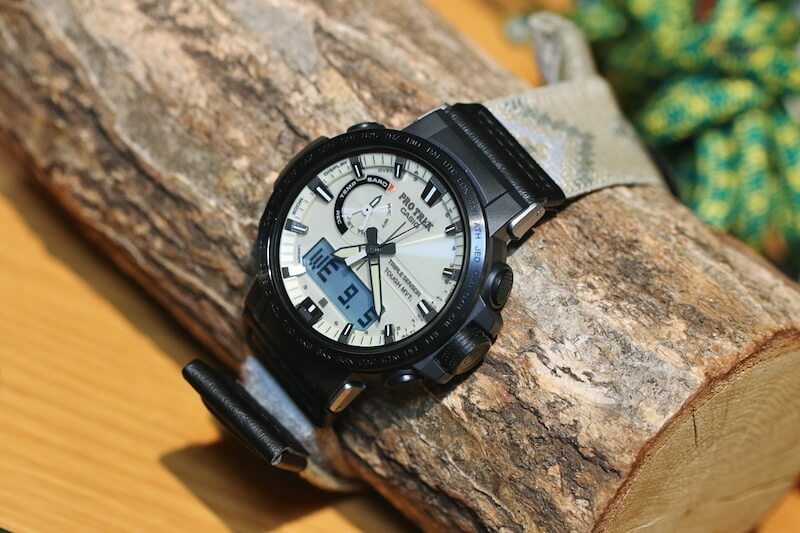 Hi Ivan, when talking of PRW-60, it seems like there is only Japan and China on the globe..
At Casio, it´s shame you sell only two models of this watch in Europe.. Thanks for response G-Central. Is there a reason like homologation or whatever for having special models only in Japan, China?